I am a learner and I am a teacher. Simple. The two, for me, are inseparable and part of the whole. 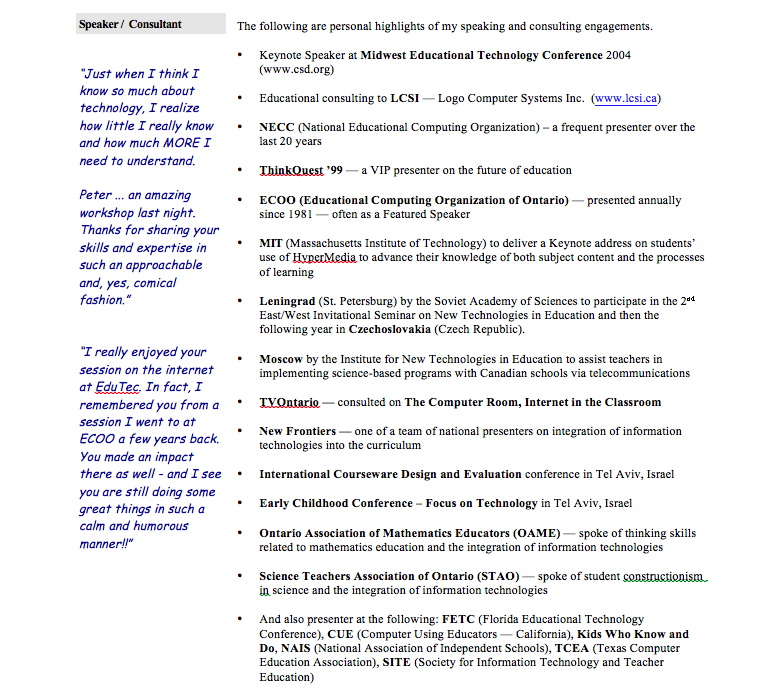 Check out the latest Ontario Teachers’ Federation conference—Pedagogy Before Technology! Also, have been involved in one of CanCode’s projects—Code To Learn. Code to Learn offers free MicroWorlds coding software to engage under-represented students in Canadian schools, working with educators to co-design curriculum activities & Coding Challenges. Rather than only focusing on “learning to code”, Code to Learn supports educators in diverse subject areas such as art & science, leveraging coding activities to meet broad curricular goals. Proud to have been recently recognized by Microsoft as a global hero in education. 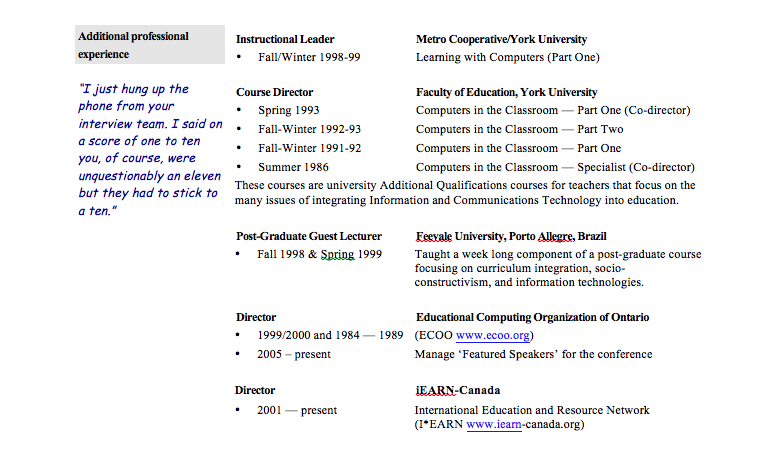 I spent 13 years teaching elementary students and 18 years as a Computers in Education consultant in the Toronto District school system. This was followed by 13 years at the YMCA of Greater Toronto. 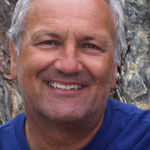 I have been involved in using computers with kids and teachers since 1977. This gives me an interesting perspective on things. I have seen many ‘saviour’ technologies come and go. So I sort of stick to my roots although I enthusiastically welcome new developments and, indeed, like to be part of them. I believe that there are technologies that lend themselves better to learning than others, but I also recognize that it is their use that is critical. To that end, I advocate models of learning which engage a student’s natural ‘desire to know’ and, therefore am focused on social-constructivist uses of ICT (information and communications technologies) in education. In the early 80s I introduced project-based telecommunications to my school district through such applications as: FrEdMail, National Geographic’s Kids’ Network, GlobalLab, I*EARN, ThinkQuest, Orillas, CitySpace, Canada’s SchoolNet and Global SchoolHouse. 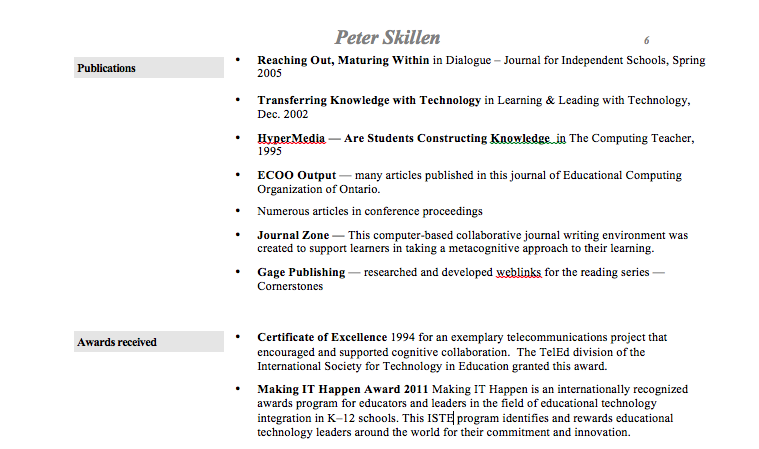 In 2000 Logo Computer Systems Incorporated (LCSI) contracted me as Lead Designer of Journal Zone – a collaborative online journal – software that I conceived and prototyped during my doctoral studies in educational psychology. This development was federally supported through the SchoolNet’s Learnware fund of Industry Canada. 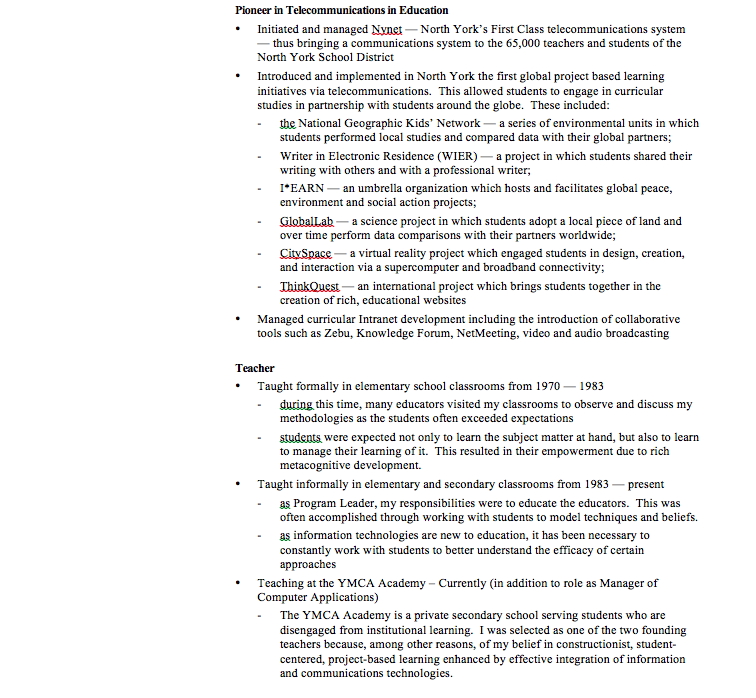 I became involved with the YMCA of Greater Toronto when hired to be the curriculum leader at the YMCA Academy – a relatively new independent secondary school focused on an holistic, constructivist and equitable approach to learning and teaching. The following are personal highlights of earlier speaking and consulting engagements. Leningrad (St. Petersburg) Invited by the Soviet Academy of Sciences to participate in the 2nd East/West Invitational Seminar on New Technologies in Education and then the following year in Czechoslovakia (Czech Republic). Post-Graduate Guest Lecturer at Feevale University, Porto Allegre, Brazil –Taught a week long component of a post-graduate course focusing on curriculum integration, socio-constructivism, and information technologies. My name is Alisa Slavens and I am a part of a PhD program in Science Education through Texas Tech University. 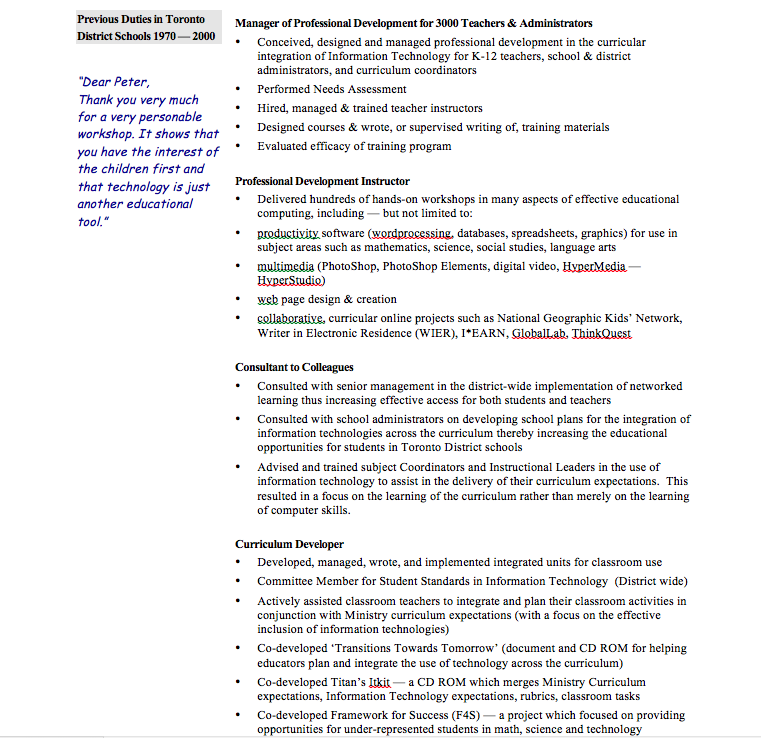 For one of our assignments we are to contact and interview an award-winning teachers of instructional technology. I wanted to see if it would be a possibility to interview you for your work. Anything you could provide me would be greatly appreciated. My brilliant young man! My wee Grade 2 rascal! How kind of you to share your feelings and thoughts with me! Honestly, what you have said means more to me that you will ever know. Thank you so VERY much! I’m going to email you because I think we should have a coffee!